Memorial Day is one of the biggest tourist holidays throughout the year in Vegas. And, it’s no surprise why. Guests visiting Vegas on Memorial Day are treated to great weather with plenty of sunshine, and a wide variety of different events and activities to help you enjoy the holiday. 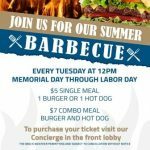 If you are planning on traveling to Vegas for Memorial Day, check out the following activities for an exciting and memorable time. No article about Memorial Day Weekend in Vegas would be complete without a DJ mention. Memorial Day Weekend boasts events from some of the biggest and most well-known DJ’s in the world, so if you are an EDM fan be sure to take advantage of this. Night and day clubs will play host to all of your favorite DJ’s including Calvin Harris at Omnia,Tiesto at Hakkasan, David Guetta at XS, and many more. If you have been feeling a little nostalgic for the magic of the ’90s lately, Memorial Day Weekend in Vegas has the perfect solution for you. The event will feature some of your favorite ’90s artists performing their biggest hits for anyone looking for a little bit of a throwback. I love the ’90s, happening May 28 at Mandalay Beach, features ’90s heavy hitters like Salt-N-Pepa, Tone Loc, Kid ‘n Play, Rob Base, Young MC, and Kool Moe Dee. The concert is sure to be a blast from the past! If you are looking for something slightly edgier but just as fun to entertain yourself during Memorial Day Weekend in Vegas, Punk Rock Bowling has just what you need. The event is a 3-day outdoor music festival in Downtown Las Vegas featuring some of the biggest names the genre has to offer along with an amateur bowling tournament. The 18th annual Punk Rock Bowling festival includes headliners such as Descendents, Flogging Molly, Millencolin, Flag with some of the original members of Black Flag, and many more. Looking for a bit of comic relief during your MDW in Vegas? Check out Chris Tucker at The Pearl at The Palms! Chris Tucker’s distinctive stand-up comedy routine on Def Comedy Jam helped him gain enough recognition in the 90’s to catapult him to comedy stardom. Tucker’s hilarious and unique routine is sure to provide all the laughs you need for your long weekend in Vegas. For an exciting family-friendly way to spend your Memorial Day Weekend in Vegas, head over to the Las Vegas Natural History Museum for an activity the whole family will love. The Weekend Science and Critter Connections program gives visitors the opportunity to explore science, culture, and history through interactive educational activities. Your little ones will love having the chance to meet some of the museum’s friendly animals as well! No matter how are you looking to spend your time in Vegas for Memorial Day Weekend, you may want to consider booking your Las Vegas suites today as they are sure to fill up fast. Weekly summer barbecue returns this Wednesday! Take some tanning tips to keep from getting toasted!